Don't miss out of exciting post of Do-It-Yourself. Like us on Facebook--->Melardenio Dot Com. I've been biking for almost 2 years during winter here in Doha. As we all know that taxi fare are steep and would be better to spend time biking. Adding to the fact that it helps me on maintenance my hypertension. Unfortunately, this winter is different for me. It seems that due to old age I can't pedal the long hill climb of Khalifa street going to TV signal and adding to the equation that poliomyelitis left foot. There are good transport alternative that I have know compare to biking without any sweat. A hoverboard, a self-balancing uni-wheel but those are not an alternative as I have hard time balancing my feet. So I guess the end for my biking and a start for a new comfortable one are the best remedy for a soaring Taxi fare. Googling around where to buy an Electric scooter was easy. You can find them all-over the net. The Xiaomi Mijia M365 was the choice for me. Giving for about 30km for a full charge on an Eco-mode and 25km for a normal mode. The office i'm working on is about 7kms in one direction giving me 14km needed mileage for a day. The E-scooter was a perfect fit isn't? I check Gearbest, Aliexpress, Amazon and they are all available and shipping would triple the cost or quadruple it.It was a chaos. It's because of the lithium policy that it is not possible to ship which I do respect. Looking then for another alternative, I found out about QatarOurshopee.com. An online shop which is a UAE based. They are selling it for 1999QR. I've order it online and put COD as I wanted to make sure it arrives on my hotel room before I pay for it. Unfortunately, they only allow COD for 800QR below. To make the story short, the order was cancelled. It didn't stop from there. 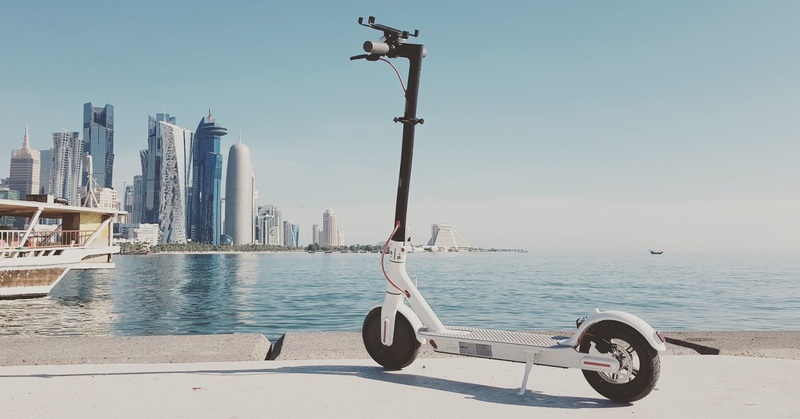 Due to my eagerness to own an e-scooter I posted on a Filipino page Pinoys Ads Qatar and inquire where I can buy a Xiaomi M365 Scooter. One user reply to my inquiry and direct me to check Xiaomi store. The shop is own and operated by Intertec. You can ask then on their page (Xiaomi Store Qatar) and inquire to the messenger. Although it didn't help alot but atleast it was able to let me know that the scooter was available. Other than that it will tell you to call the shop. So where to find a Xiaomi M365 Electric scooter? on Google map, Search for Xiaomi Shop. It will show you the shop is near the Family food center, Located in Al Nasr. I have added a link map for you not to get lost. Kindly click on the below. Once you own one please join the Group Xiaomi M365 Qatar. Let's scoot! Some photos on my test drive in Al Corniche.